Humans usually narrate memoirs, and furthermore, humans usually author them. Memoirs of a Papillon deviates from this norm: Genevieve, a pure bred Papillon, narrates her puppyhood, her life with Katrina and Denny, and the advantages and disadvantages of living with humans. The Appendix provides a quick quiz to answer the question that many canines must have asked about their owners, titled, “How Intelligent Is Your Human?” Genevieve measures intelligence in humans by whether or not they possess the keen logic skills of a canine. What does your human do when you lick his face? The higher you score, it seems, the closer you are to intelligence. Genevieve has received the aid of Dennis Fried, Ph.D., or Denny, to put this narrative onto paper. 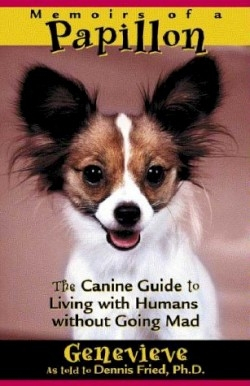 Memoirs of a Papillon is well written and provides humorous insight into exactly what your pet is thinking. For non-pet owners, it should help clarify what they are missing by failing to bring a Papillon into their life. Genevieve has fashioned a book that will further lift the veil on the relationships between canines and humans.